I had a great conversation with a new friend yesterday. He’s a dentist and is looking to drive continuous improvement within his small organization. He’s feeling overwhelmed, since he’s busy with being a dentist, running an office, and managing a small team adding any extra responsibility seems like it’d put him over the top. He wants to do process improvement because he things that there’s a lot of waste in his small organization but he is terrified of starting because it seems like more work that he doesn’t have time for. No it means that we need to measure the value added component of their time in the clinic and set a goal of that as close to 100% as possible. This means warm hand-offs between any assistants and the doctor, it means no waiting in the waiting room. No waiting in the office for people to come. None of this is something that we’re willing to pay for, yet we must pay for it. Actually in most cases our employers are paying for it through lost productivity at our jobs. Moving towards patient centric offices also changes the how the patient expects to interact with you. They will know more because they did some research coming in, this information could be wrong so it will take more time to explain to them the correct diagnosis. People using WebMD is a result of dissatisfaction with existing doctor offices. Becoming more patient centric is a big deal and takes a lot of work. Where do you start? With anything. Yes that’s a bit of a cop out statement, but it’s also true. Pick anything that is causing pain for either your staff or your patients and map it out. Figure out what the process currently and where the wastes are. Work to eliminate them. Start with something small like how you answer the phone or greet the patient when they walk in the door. Figure out who should be doing this and how to ensure it’s the right person doing this work. Start somewhere. Start where you can have a quick win. Start where you think it will help the patient quickest first. This is part of my ongoing Lean Disruption series where I write about how to combine Innovation Theory, Lean, Lean Startup, Agile, and Lean product development. Since values and metrics drive processes how can you enable innovation in an organization that isn’t completely willing to support innovation? As I mentioned before Skunkworks are a key component in this process. Using emergent strategies with Lean Startup tools such as the Lean Canvas are another key method to enable innovation with the skunkworks approach. However, not every organization can or will truly allow this approach. In organization that cannot or will not support a skunk works approach to innovation what options are available? In the case where you are a manager of more than yourself you have the ability to implement Lean within your small organization. Owning the processes within your organization and becoming a coach to your employees, can begin enabling metrics that drive customer centric focus. This is possible by taking a single step and picking a metric that will move the metrics that your bosses care about. Focus on improving one process at a time. Start with something that is completely in your control, such as how you hand off material within your group that goes to other groups. Measure the number of errors your group introduces, however do not blame people. If things are wrong investigate the root cause of the problem rather than accusing your people of causing the problems. Problems can come from the group that handed off the work. In those cases, create a process to review the work looking for errors and then work with the team supplying that work to eliminate those errors where you can. In the case where there are errors within your team, you work together to uncover each source of the problem. As a manager you own the processes as much as the result of the work your team does. The final output of your work is 100% dependant on the processes that lead to those output. Another important step is to work on converting your daily meeting, assuming you have one, into a daily standup rather than a typical beat and greet. These meetings instead must cover the goals for the day, issues from the day before, and follow up to address those issues. 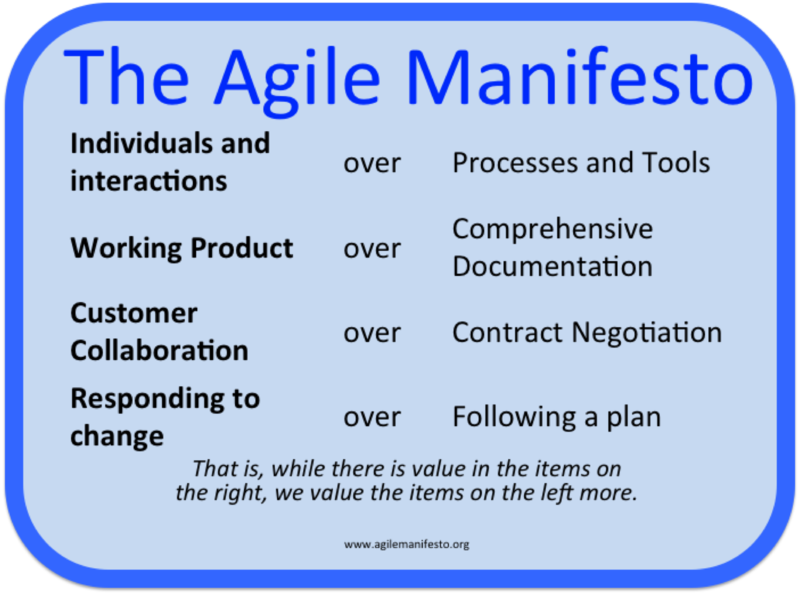 In the case where the team has projects they are working on, this can become an opportunity to being pulling in some agile stand up practices, such as “What did you work on yesterday, what do you plan on working today, and do you have any impediments?” These questions can help change the way projects are run within your group. To improve processes within your group, the best way to do this is to go to where work is being done. You must actually watch as work is being done, while keeping in mind that the way work is being done will change as you watch people work. Make sure they are aware that you are not going to be critical or even record who is doing the work at the time. Record the information and move on. You should not use this information in their next 1 on 1 or review. The goal is to learn how people are doing work especially across work types and workers. After you map the process review the results in your daily stand up to discuss potential issues. Partner with your team to find the root cause of the problem and empower them to make changes to their processes. Before you change the process it is important to measure current state and measure the impact of those changes on the metrics that matter to you. Keeping in mind that you must make all changes from a customer’s perspective. These are the easier things to implement. However, making changes and getting support in this change from your leadership isn’t going to be easy, so you must show that you’re making wins and improving the result of your work. That’s all leaders care about. Successful process improvement opens the way to broader innovations. Start small and then move into larger projects as you have a better understanding of what you are trying to do. This is part of my ongoing series on Lean, Lean Startup, Agile, Innovation, and Disruption. This topic always gets a lot of press and it is truly covered in just about any business book these days. In fact the Disruption perspective offers the suggestion that a product is hired to do a given job, so you need to understand what the customer is trying to do and then start figuring out what how to best solve that problem. Typically, people start with the solution. Engineers, designers, programmers have an idea for a solution a product that they think people will like because they find the solution to be a cool idea. So without consulting true customers through interviews they do other “market” research which may or may not really ask the right questions because they might not truly understand the problem that they are truly trying to solve. A solution might sound good and people might say they are interested in it, but if it truly doesn’t address their problem. This is why the Lean Canvas is powerful, because if forces you to truly confront the problem your solution is trying to attack. The point isn’t that you or anyone else know better than your customers, you truly don’t. You might have an idea that could be something that your customers could use. You don’t truly know. Having confidence if vital for success, but you truly need to test that through interviews and planned conversations. The iPhone wasn’t successful because it was truly novel It really wasn’t, the phone wasn’t able to handle 3G, it didn’t have copy and paste and many other features that Blackberries had for years. Things that standard businessmen needed. However, that wasn’t the market Apple was going after initially. They were going after high value customers that were not having their needs met with existing smart phones. They knew their customers would be willing to pay a premium because of the more and more advanced iPods the company was selling. Apple was able to look at the competition and see what was working well, what was not working well, and what features customers truly needed. The first iPhone was truly an MVP, but the problem Apple was trying to solve was different than Blackberry or what Nokia was thinking of solving. This is why they were successful. They understood the problems their customers had. They didn’t have the most innovative phone on the market from the hardware perspective. They figured out how to attract customers through an easy to use UI. The problem people had with with Smart Phones was that it was terrible to use. Solve that simply and elegantly, you can rapidly expand into different customer segments. Then quickly move into those other segments as businessmen bought the iPhone as a personal phone and wanted to replace their Blackberry. Assuming arrogantly that you know what the customer wants will likely lead to failure as much as asking the customer what they want/need. Identifying a viable problem and validating through experimentation is the best way to determine if it’s truly something your customer wants. This is part of my ongoing series on Lean, Innovation, Lean Startup, Agile, and disruption. Kanban is a tool in Lean which is used to help send messages downstream without needing to actually talk to each other. Which is powerful in a manufacturing setting as communication might be difficult depending on the environment. Kanban translate as card from Japanese and typically has information related to the number of items that need to be in a bin and what the item is that needs to be in a bin. Some Agile practitioners have adopted Kanban to be a set of steps in the process for developing software. This could be as simple as Ideas, To Do, Doing, Completed, or as complicated as Backlog, Wireframe, Coding, QA, Testing, Integration, Complete. Ideally, simpler is better, because more bins make management of the lists much more complicated than if there are that many phases in the Kanban board, but this is really up to the preference of the team and whatever works best based on the Build measure Learn approach. Even developing a Kanban system for software development the team should view it as another possible to learn how to work with each other better. This includes the information that’s required for a piece of work to be started. For example, determining what information is the minimum for a User Story is something that must be agreed upon by the team. Furthermore, the Acceptance Criteria can help reduce the number of steps on the Kanban board as these may simply be part of the acceptance criteria for a complete story. Using stories and Kanban board can help with Innovation through creating bite size pieces of work that can be designed to reduce the environment of uncertainty the product is being developed in. Since uncertainty is the greatest risk to the project it is vital to write user stories and use the kanban board to maximize efficiencies with developing a new product. The Kanban board is also extremely effective for ensuring that startups keep their energy focused on the most important thing. No work should be done on an item if the work is not on the Kanban board. If the work is vital to the startup, then it needs to be recorded and validated that it’s the right thing to be doing. 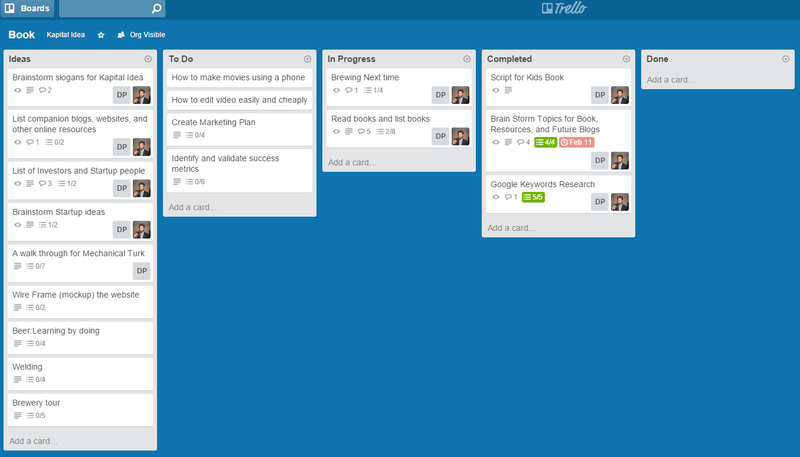 Yes, it might slow things now, but the Kanban board is an effective tool to help people understand who is working on what and how those interact with other problems out there. This doesn’t meant that immediate issues shouldn’t be resolved immediately, but for development purposes no new work should be done without having an item on the Kanban board.